Margie's first racing experience took place one weekend when her parents were out of town. She "borrowed" the family Buick Electra, made some minor modifications (popped off the hubcaps and disconnected the odometer) and drove the car from Lincoln to Omaha, Nebraska, 60 miles away, and entered the bracket drag races. She's had the urge to race ever since. Margie started racing professionally in 1978. Her first ride was in a Porsche 914-4 at the IMSA race at Road America. She competed for several years at major tracks in the U.S., including Daytona, Watkins Glen, Phoenix, Riverside, and Portland. She and her husband, Paul, raced their Porsche 924 GTR's as a team from 1978 to 1989. In 1983, Margie drove for Dan Gurney in the Riverside 6-Hour Endurance Race. Her co-driver in the factory Toyota was the actor, Gene Hackman. That race led to a call from Jurgen Barth of the Porsche factory team and to a drive in a Porsche Kremer CK-5 at Monza. From 1983 to 1985, Margie competed in the World Endurance Championship Series in Italy, England, Australia, and France, driving Porsche 930 Turbo's, Porsche Kremer CK-5's, BMW Gebhardt's and BMW URD's. Her top finishes were on the podium with third places at Brands Hatch and Mugello. She drove in the 1984 24 Hours of Daytona in a 911 RSR, finishing 6th in GTO class. She was the only woman to drive in the 24 Hours of Le Mans in 1984 and 1985, running as high as 1st in C2 class. In 1988, Margie began competing in the American City Racing League, driving a Sports 2000 and representing Team San Diego. She finished 3rd in 1991 and 5th in 1992. 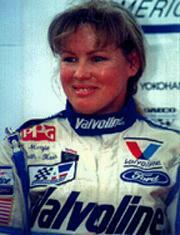 In 1994, Margie competed with 42 male and one other female driver in the ACRL. Margie took over the lead in the Drivers Championship in the third race, at Laguna Seca. From that point on, she never gave up the lead and after setting two consecutive poles, she clinched the Championship in the 7th race of the 8-race season. Margie is the only woman ever to win a professional road racing championship in North America. When Margie isn't competing in race cars herself, she drives the pace cars and does precision formation driving at PPG IndyCar World Series races all over the United States. Margie spends a great deal of time in public appearances, as a motivational speaker to corporate sales meetings, and as a guest speaker for clubs, career classes, and television talk shows.